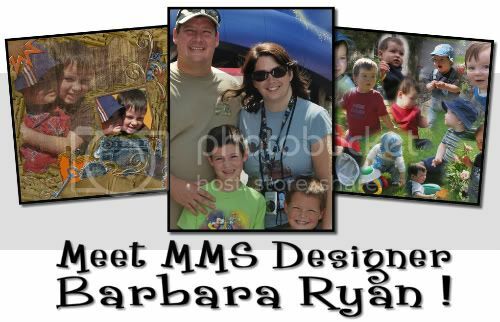 MyMemories Blog: Meet this week's Featured Designer, Barbara Ryan!! Meet this week's Featured Designer, Barbara Ryan!! I live in the Albany NY area, but am originally Canadian, from Montreal. I started in the digital world with designing photo collage after my first son was born and I had too many photos to possibly display all the ones I loved. That turned into a business after doing it for awhile for friends and family. Naturally, when I started creating photo books later on, I wanted to dress them up a bit more than what was available on the photo book sites and started looking around and discovered digital scrapbooking. I got heavily involved right away joining a few Creative Teams and having a blast! I then tried my hand at designing and have been doing it ever since. Take a peek at some of Barbara's AMAZING stuff in her MyMemories.com Design Shop! She'd love to share a $100.00 shopping spree in her shop with one lucky winner! So, please check out her store at MyMemories.com and pick out a few things you might like to have and it might just be your lucky day! Winner will be posted next Monday! And, to those of you who have patiently waited - here is the winner from Lindsay Jane's shop giveaway! Please send an email to me at LisaJ@MyMemories.com to get the information you need to claim your prize! Checked out Barb Ryan's designs, love her Urban Edge papers, Bliss Quick pages and the Project 365 pages. Congratulations Ladies! Enjoy your new kits! It is nice getting to know you Barbara. I truly love your Tuscan Sun. The colors are so relaxing! I LOVE how many "boy" kits Barb has! Since I have 5 boys, I am always looking for more masculine kits! I've added all of them to my wishlist, lol! beautiful kits here...I love the "Just Beachy"
I like her Egg Hunt kit and the New Baby Boy & New Baby Girl designs! Cute! LOVE Barbara Ryan! Magic Treehouse, Urban Meadow packs, envy, and all the masculine ones since I have 3 boys! I love the vintage papers and the urban edge papers! I like it all...especially the Urban Papers! I would have to say that my absolute favorite is With This Ring Pack. Than again Happy skies and After the Rain are great as well. They are all so good it is hard to pick. Her masks are really great. Would love to own a few of them! Hi Barbara, I love your templates. Especially the ones with beach and water themes, like Sandcastles and Just Beachy. They've got just the right feel for capturing those days at the beach on or on a beach-related vacation! You have lovely stuff! My fav's being your photo masks:) Thanks for the opportunity to win. I think it's great that you have extra things, like masks, borders, and overlays. I love the designs...In Love, Artsy Papers, Urban Edge Papers, Twilight are some of my faves. Love the Artsy paper pack. It 's so rich. Also in love with the Twilight template so wonderfully gothic. Love to own the rest. I'm glad Barbara is featured and I got to look at all the lovely designs and colors (loads of my favorite Orange!). Tuscan Sun, Autumn Haze, Naatural Woman, Sweater Weather and Picture It are at the top of my list. Wish I had the time to look at every single one but I couldn't do it just now. I sure could do a lot with a big coupon! I really need kits to start scrapping with. Thanks for the chance to win!! She definitely has some of my favorite designs! Fabulous! Just checked out Barbara's store, love the templates that she has available! My favorites would have to be Natural Woman and Summer Bliss. Beautiful designs, and what a generous giveaway..wow! Holy, cow - did I read that right? a $100 spree? I'd have to start with the "High Five" design pack - that has my daughters style down to a T! Thanks for the awesome giveaway! Congrats to the winners! I love Road Trip but the masks are amazing too. So many beautiful kits. I love Picture It and Monkey Business. I have many added to my wish list! Not sure why I became anonymous, lol! Not sure how to delete it. I do have many kits added to my wish list, love the wish list option! Oh what a great prize! I have my eye on a couple in your shop- In Love and Tuscan Sun are on my list. My favorites from Barbara's store are With this Ring pack and the Brushed Overlays. Barbara Ryan's 'With This Ring' immediately caught my eye as I'm preparing to create an album for my son's wedding that was on 9/10/11 @12...lol. Tuscan Sun is also one of my favs; it's pretty hard to choose. There are so many nice ones. Barbara's Mother's Love is just right for my scrapbooking at the moment and many other of her products would be very helpful. This is a very generous giveaway and would afford some tremendous help too. Thank-you. Aremus and Margaret are SOOOO lucky! Congrats! Barbara has so many great designs. Obviously she's a very creative lady. While I see my own pics in each of them,I am most drawn to Urban Meadows sets and the Vintage Victorian Papers (I am very involved with my family history). HiBarbara! I love your magical events pack, thanks for the chane to win! Congrats to the prior lucky winner! Hi Barbara.....Nice shop. I'm working on a Wedding album right now so of course my favorite is "With this Ring"
The Artsy Sky is my favorite - modern, yet fun. I think I could get everything since I just started and it is all way fun but I really love the monkey business and the with this ring pack. I really like her the After the Rain kit. I absolutely love the Magical Events pack. Its perfect for a Disney album. I enjoy the Artsy Paper Pack and the Urban Edge papers and packs. Those easily compliment my personality as well as scrapbooks on which I am already working. They would mix wonderfully with several other packs as well. Thank you for offering up this prize. Wow I love these designs!!! I will be adding some to my wish list for sure! I'm in love with Just Beachy- I'm wrapping up pictures from this summer and that kit would be perfect! Wow, it's so hard to choose. I love Barbara's kits because there is such variety among them and they are all beautiful. However, if I had to pick just one I'd pick "Dreams Do Come True." I love all things Disney & that is just what this kit reminds me of-lots of wonderful, magical memories. I already had to have Urban Boyz and Magic Treehouse, but I also like Graffiti to go with them (love that hardware style) and the French Country Masks. I have a bunch of your kits. I used your magical events pack for my son's first birthday. It just makes me smile everytime I look at it. Keep them coming! I love Pinks, so I am partial to the "With This Ring" & "Mother's Love"
I'm really new at this, but loving it so far! Thanks for a chance to win some goodies! It's nice to meet you. When I started looking at your kits and noticed I already a few. however found a ton more I'm dieing for! A few I want right away is Branching Out, jack, and all the amazing paper packs I saw. For some reason I'm a paper freak... hehe Well hope you pick me cuz I could buy the shop if I could!